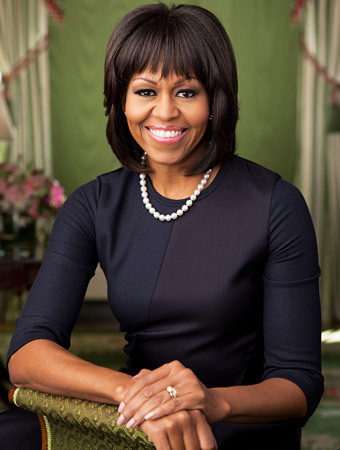 US First Lady, Michelle Obama is looking FAB in her new look. She is rocking a new layered fringe hairstyle and an asymmetrical navy dress in her second official portrait released by the White House. She looks super cool yet sophisticated. The dress, which i like to call "The glove" is trending. My Sis got me the green and black version and it's so cool..
#Tip: If you've got an unflattering waist, you will need to wear an unwired tummy shaper underneath the glove"